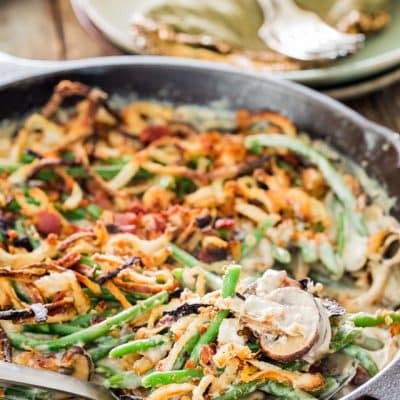 Green Bean Casserole from scratch – this delicious green bean side dish is a must have on your Thanksgiving table. No canned stuff here, only fresh ingredients. Green Bean Casseroles are probably a classic and every cook probably has their favorite recipe stashed away in their repertoire. While some prefer using frozen and canned ingredients quickly tossed together with some green beans, I prefer a clean recipe with fresh ingredients and all made from scratch. 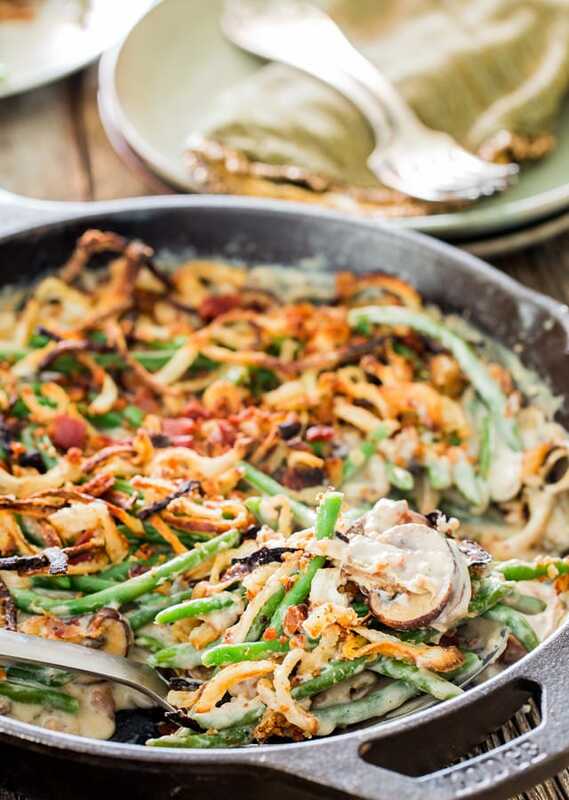 My favorite thing about this incredible green bean casserole is the crispy fried onions. All in all, this casserole is my family’s favorite. A true comfort food that’s a must on your Thanksgiving table. While many prefer to use canned green beans, I prefer fresh green beans or even frozen. I strongly recommend this over canned green beans because the beans will be nice and crispy and not mushy. Frozen green beans are already blanched and flash-frozen, so if you’re using these, you can skip the blanching step. Just be sure to thaw and drain the green beans before adding them to the casserole. To thaw green beans, place them under running water in a colander. Let the beans drain while you’re preparing the rest of the casserole. Onions: Prepare the onions first as instructed, since these require baking in the oven. While these are baking you can get on with the rest of the casserole. Green Beans: If using fresh green beans, blanch them first as instructed, otherwise if using frozen, thaw them as mentioned above. Sauce: Melt the butter and saute the cremini mushrooms. Season them as instructed then add the flour which will soak up the moisture that mushrooms usually released when cooking. Add the chicken broth and heavy cream and whisk until the sauce thicken. 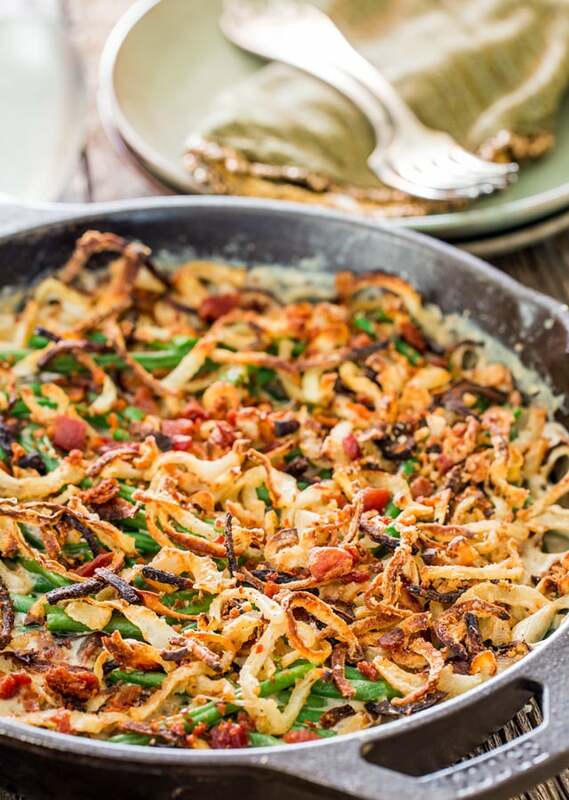 Assemble: Add the green beans to the sauce, the bacon and some of the crispy onions and combine everything together. Top with the rest of the crispy onions then bake for 15 minutes until bubbly. Green Bean Casserole from scratch - this delicious green bean side dish is a must have on your Thanksgiving table. No canned stuff here, only fresh ingredients. Preheat your oven to 475 F degrees. Spray a baking sheet with cooking spray. Add the flour, breadcrumbs and salt to a bowl and mix. Add the onions and toss them in the flour mixture. Spread the onions over the baking sheet and bake for 30 minutes or until crispy and golden brown. Reduce the oven heat to 400 F degrees. While the onion is in the oven, start by blanching the beans. Add about a gallon of water and a tsp of salt to a large pot and bring it to a boil. Add the green beans to the pot and blanch for 5 minutes. Remove the beans from the boiling water and plunge them into a large bowl of ice water, to stop the cooking. Drain and set aside. Melt the 2 tbsp of butter in a large skillet over medium heat. Add the mushrooms, season with salt and pepper and cook for about 5 minutes, stirring occasionally. Add the minced garlic and nutmeg to the skillet and cook for another minute or 2 until the garlic becomes fragrant. 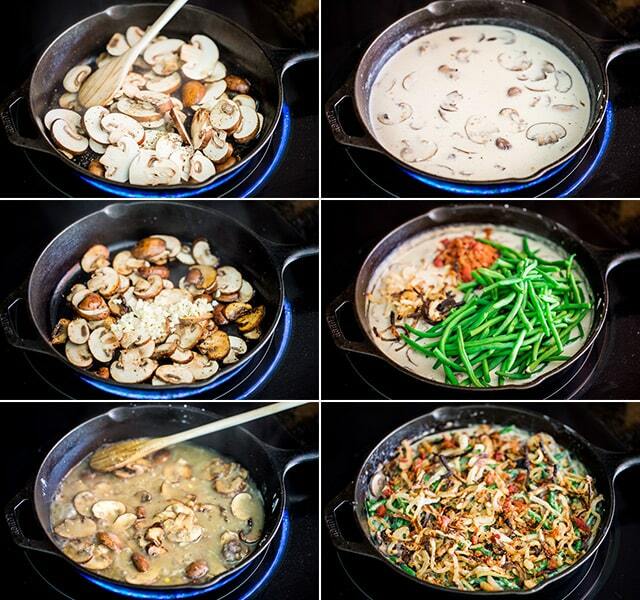 Sprinkle the 2 tbsp of flour over the mushrooms and stir to combine well. Add the chicken broth, stir with a wooden spoon and cook for a minute. Decrease the heat to medium-low and add the heavy cream. Continue cooking for another 6 to 8 minutes until the mixture thickens. Turn off the heat and add the green beans, chopped bacon and a quarter of the crispy onion. Stir well then top with remaining crispy onions. Place the skillet in the oven and bake for 15 minutes until bubbly. Make-ahead instructions: Prepare everything as directed, except turn off the oven after the onions are done. Once the casserole is finished and assembled allow it to cool completely. Cover tightly with foil or in an airtight container and refrigerate until ready to serve. Before serving bake it int he skillet for about 20 minutes or until bubbly at 400 F degrees. Panko Breadcrumbs: Panko is a variety of Japanese flaky bread crumb used as a crunchy coating for fried foods. Once you have made this, you will never return to the *old* version. Also, I am finding this site to be outstanding with its quality recipes. Thanks Mabel! So happy you’re enjoying my recipes! Just found this recipe and am going to make it for Thanksgiving dinner. Sounds like this recipe can be made ahead of time and frozen. What do you think? Made this today and I’m considering not serving it so I can have it all to myself. It’s that good. Thank you for the recipe!! Does this reheat well if I wanted to make it the night before? Yes absolutely, you can either pop it in the oven for a few minutes, or just microwave it. Looks fabulous! Can anything be done ahead of time? Thanks! Absolutely! You can blanch the green beans ahead of time and make the crispy onions. You can store the onions in an airtight container in the fridge, and because the casserole will go back in the oven, the onions will crisp up again. Ok, Jo, now you’ve gone and done it!! I have to make this! I love that it uses all fresh ingredients. This sounds delish! Thank you! You’re welcome Cynthia! Let me know how you like it! That looks so simple yet so good!! I have trouble of thinking of good dinner meals I will have to try this! !